The golden eagle (Aquila chrysaetos) was once widely distributed in the uplands of the British Isles, but is now extinct in Ireland, and largely confined to the highlands and islands of Scotland. As the precise extent and severity of the reduction in population size are unclear, it is important to understand how the population was affected by the decline. We therefore genotyped 13 polymorphic microsatellite loci in 172 individuals from the contemporary British population and compared their genetic diversity to 70 British and 9 Irish museum specimens. Despite the recent population decline, there is only slight evidence for a concomitant loss of genetic variation. Instead, two likelihood-based Bayesian methods provided evidence for a severe ancient genetic bottleneck, possibly caused by the fragmentation of a large mainland European population and/or the founding effects of colonising the British Isles. As the population persisted despite this ancient bottleneck, our conclusion is that there is limited need for intervention to augment the present-day genetic diversity. 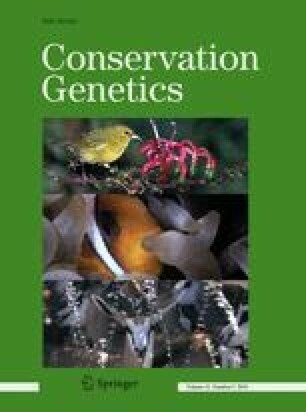 The main short-term objective of conservation measures should be to increase population sizes by continuous safeguarding of individuals and habitat management. Finally, we also confirmed that, for management purposes, the species should be considered a single population unit and that the extinct Irish population was not differentiated from the British one. We thank Scottish Natural Heritage and the Royal Society for the Protection of Birds for putting their support behind the contemporary sampling effort. We thank Stuart Benn, Roger Broad, Kenneth Canton, Ian Dillon, Desmond Dugan, Kenny Graham, JR Grant, Mike Gregory, Roger Hayward, Kenny Kortland, Ian MacPherson, Liz McDonald, Lorcan O’Toole, Robin Reid, Chris Rollie, Logan Steele, Bob Swann, Tom Talbot, Des Thompson, Dave Walker, Phil Whitfield, Andrew Wight, Richard Wood, the Centre for Ecology and Hydrology, the National Museums of Scotland and the Scottish Raptor Study Groups for providing contemporary DNA, blood and feather samples, and Ian Dillon and Mark Eaton for providing additional geographical information on samples. We thank Noble Henning, Barbara Kerr, the American Museum of Natural History, Cambridge Museum of Zoology, Glenveagh National Park, Hancock Museum, Kelvingrove Museum, Leicester Museum, Liverpool Museums, Museum of Comparative Zoology Harvard, National Museums of Scotland, Norfolk Museum, National Museum of Ireland, National Museum of Wales, Natural History Museum, Oxford University Museum of Natural History, Townley Museum and University College Cork for kindly providing historical samples. We thank Michele Clarke for acting as a research grant PI. This work was performed at the Sheffield Molecular Genetics Facility and funded by the Natural Environment Research Council, UK, and the University of Nottingham.